There Rickshaw Challenge Classic Run 2019 has ended, but the good stories remain. It was a great event with an amazing group of people. 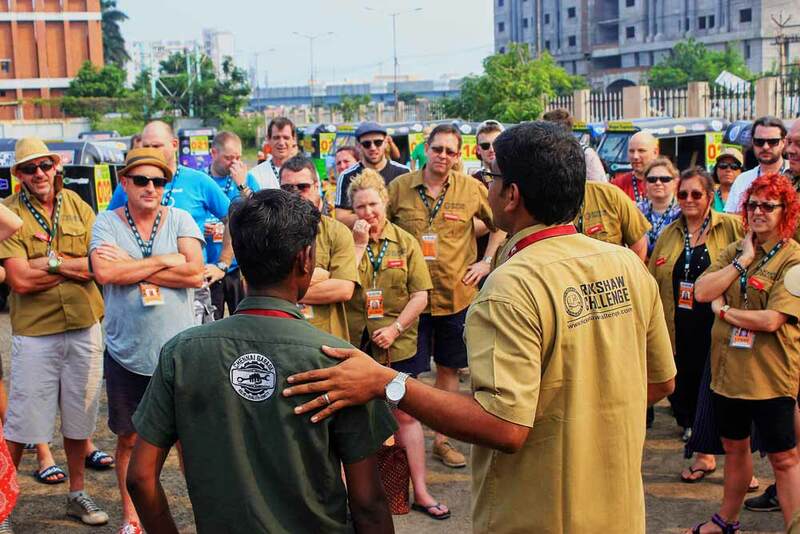 Our teams had parties, the usual breakdowns (rickshaws can be fickle beasts…) and now they have countless stories to tell, once the reach back home. 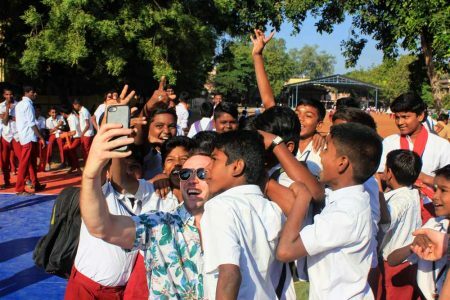 Now here are the inside stories about the Rickshaw Challenge Classic Run 2019 that we all have been waiting for. Head organizer Princely tells us all about the event from his point of view! Welcome you all for this crazy adventure and our Rickshaw Challenge’s annual event Classic Run. This event had crossed 11 years and stepping in to the 12th year with minor tweak in the route. The total number of teams were 32 and total number of participants were 80. Our organization team had set up two counters to deal with the crowd and time. Even though it’s not unusual we had many people who grouped themselves before they could register themselves in the rally participation. Team 21 Tinky Winky, Team 22 Dipsy, Team 23 Lala and Team 24 Po is the biggest of the group with 10 members. Likewise, Team 2 Woohoo!! , Team 13 Carpe Diem, Team 14 Freddie’s Folie and Team 27 Alpine Dingoes consisting of 8 members is very interesting combination of sons and mothers drawn by Regan Worley, the hair dresser, of Team 2 with a soul aim to rejuvenate the people who hit the monotony in their life. Furthermore Team 7 and Team 8 Getthatindia 2 and 1 respectively, then it is Team 3 The Flying Kiwi, Team 6 – Bon Vivant and Team 9 AFLO formed another group. Rest of the teams were new to each other and formed a formidable army of 80 people and that has created a hype right before the rally could start. Yes, I mean the call I received from the Immigration Office to check whether this Rickshaw Challenge is illusion or reality. Thus with the reality check, we will step in to the events which followed one by one to make it a complete life changing experience. By 11 am exact the briefing started, I did not opt the luxury of microphone and I felt the mistake in the last stage of the speech. Holding up and finishing it successfully and in a purposeful manner, the event moved on to the practice ground. Even before I could enter the ground I saw almost 10 to 15 teams on the move. Then I had to purposefully hold on to them to teach them the basics of fuel mixture. I think some of the people didn’t pay any attention as that was the main reason for the break down even on the last day of the journey. Whatever is said and done, at the end of the day it is only the numbers that speak. When we count 32 in the hotel then its all fine. The practice did not go without the essential excitement. Team 14 Freedie’s Folie was the first team to break down. An interesting journey by Judith Ham who got a muscle breaking down syndrome but she is a gallant fighter. Her son Geoffrey, who is a music teacher by profession, had taken up the challenge for his mom – an inspiring story to go through. Their Vehicle broke down with electrical failure within half an hour of the start. The mechanics could not find the suitable system and they eventually had to swap the engine. It was done within half an hour and to everyone’s amusement and indirectly increased the confidence of the teams in the Chennai Garage. At the first junction on the way back to the hotel, on the busy Indian road, Team 4 RickShawn of the Dead faced the challenge of a technical snare in the vehicle and the Chennai Garage showed all their experience to navigate the team out of the chaos and fixing their problem in that sea of traffic was another booster of confidence. Thus the first day’s program came to end. The finish was the welcome drink for the teams, which was arranged at the pool side. The great crowd sat together with beers, just like a mighty congregation of battle leaders. Even the Gods were among them, listening to the stories and laughing their heads out. Thus a smooth start become evident, which additionally motivated the support crew and organization team. The day started at 7 am when the teams started dropping the bags and went for the breakfast. Handling 80 people’s bags was much easier than what I thought about. We had a strong team of 3 people to handle the situation with a smart kid of new age from Manipal University, Mr. Sowmeyan. Round Table 42 chairman Mr. Piyush came for the flag off. Before that, he introduced their projects and made an appeal to the participants for their noble case of ‘Freedom through Education’. At 8.30 am all the participants gathered for a group photograph and then it’s just go after that. Our Chennai Garage team was split with two teams in two different vehicle and it all went well for an hour or so. The first team to call up the support was Team 13 Carpe Diem. We met them outside of Mahabalipuram and rectified the carburetor issue. Then after this I received a call from Team 2 and they called for support. Interestingly it took the support crew two hours to find them. This adventure brought the human element of the rally, even though we have the most advanced technological system of maps and location. Just don’t think that you had overcome all. Wait there is still more to come. Team 4 Rickshawn of the Dead faced a challenge which they shared with me during the flag down at the hotel reception. They bumped in to a two wheeler and they settled it with money and negotiation skills. Then it’s all a cruise down to Pondicherry. There were 5 teams who got already settled in the base hotel much before I could enter the reception. One by one all the teams drive in to the base hotel and the night got settled early. There were couple of more calls for support and the support truck had it easily sorted out without much hassle. All went well and the participants were well briefed for the second day of anticipated long drive and bad roads. Everyone was aware of the fact that the last bit of the drive to Tanjavur was a bit more crazy than expected. The Round Table had arranged a project visit and at the briefing we had egged a plan to make it to the hotel. The plan was a crapper and only 10 teams made it to the project. But that was the only story I can remember for the whole day. It was around 6 pm all the vehicles, were in the base hotel except one. There was no call for support on that day. Would you believe it, what expected to be a nightmare day went in so smooth without any issues. But hold on a second, not before I heard stories from many teams how the private bus drivers behaved on road. It is one of a hell of an experience. So many close calls. Team 19 AWE (Awesome Wild Estonians), did not turn up before 7 pm to the base hotel. I tried calling them and find out and that did not serve the purpose. Finally they arrived at the base hotel and told me that they were immersed in a conversation at a food place that they lost soo much of time. Then Thanjavur night is hell with a big pool and unending serve of beer, were no devils could complain. The day’s drive started with the recommended visit of Thanjavur’s big temple, the Brihadishvara Temple. It never failed to surprise no one. The grandeur of the temple and its magnanimity is simply a whavoo!-factor. The first call came from Team 13 and it was bit of a delay to attend them before the support team could make sure they are on the right way. Tirumayam Fort is another pit stop where the second support crew staff Babu had a busy time with a couple of vehicles. Team 5 Coworking were another bunch of guys who were not interested in getting their oil mixture right. They did not use the water bottle trick and they failed completely. They might have broken down like at least once a day and every time the mechanic team needs to clean the carburetor and set them again. Team 6 Bon Vivant broke down for the first time, but they got fixed in no time and they did not lose time as well. All teams reaching Madurai and then taking them to the retro party for New Year’s Eve was fun. 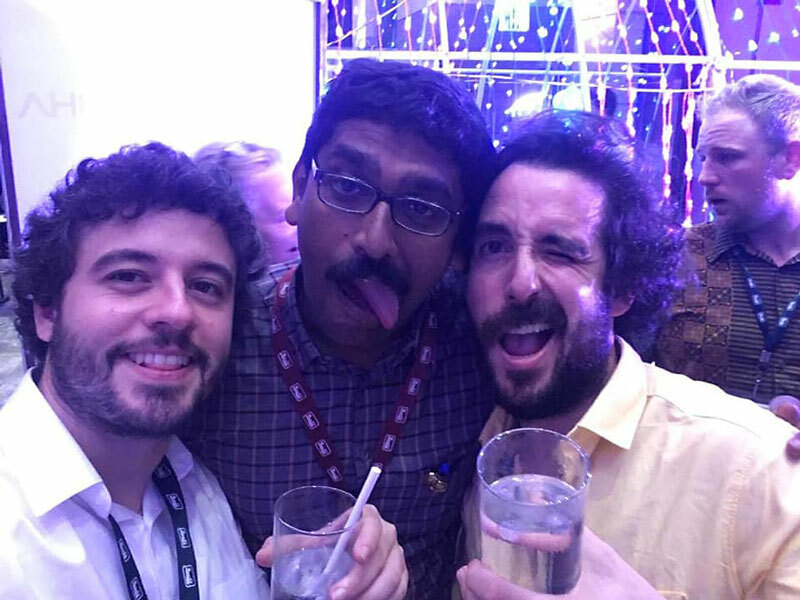 Don’t ask me how did it ended and how the teams reached the base hotel… Rest is all history and I need investigator Aravind, the Chief Scientist, to have another blog on that. The demons of party wanted the angels to quench their thirst and heal the head which was banging from the previous night’s retro party. But even on this hungover day we had a small success story: Team 29 That’s what she said from Spain and Team 31 Surprise from Hungary had lost their bags in airport transit. 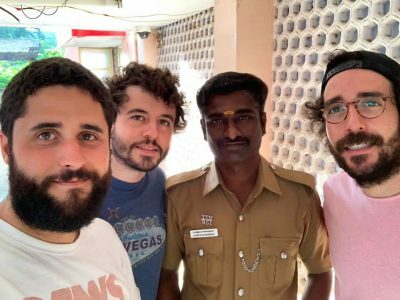 Even though the Team 31 recovered it early, the Spanish team of three dudes had to wait till Madurai to pick up their luggage. But today they got their bags and could finally put on some clean underwear! And for us it’s just another three additional bags the next day to Rajapalayam. A new route to Rajapalaym is the twist in this year’s trip and blended as divine element for the teams. At Srivilliputur, teams went to the famous Andal Temple and picked up the palm leaf made parrot and used it as a good charm for the rest of their journey. After a short detour of Ayyanar temple, which was attended by most of the teams, they were already on their way to the base hotel. The small drive came as a breather and the base hotel pool was like flooded with so many people and overflowing beers. Another short day is fit for a finale with a surprise celebration in Thoothukudi. The day had a different set of surprise for me as organizer. Because of politicians and the social issue of pollution in Thoothukudi, a big riot had happened. 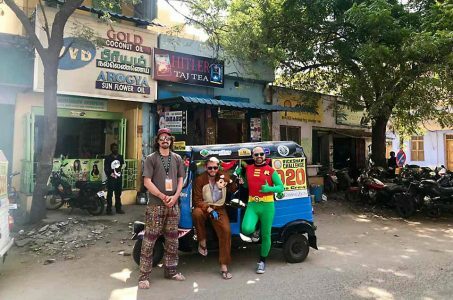 Being foreigners doing some crazy activity of driving a tuk tuk caught the attention of local police and they immediately related this to that previous issue. I had almost my day gone before explaining every officer on what we do, the details and all the events briefing. That become by heart and that was useful for me for the next day events in Bhramajothi Farms. I had some serious issues with double bed of twin separate beds and king size bed. Judith of Team 14 Freddie’s Folie sat with me and gave me time of advice in many ways. I took it in a very positive sense and that sensed me that the evolution has not yet completed. In a sense it will never get completed till its activated time. Day 7 Local Culture and Pongal celebration. To be precise, Aravind, the founder of the Rickshaw challenge and king of craziness, is a native of Thoothukudi and the Pongal Festival we are celebrating for every Classic Run happens on his father Mr. Bhramanadam’s farm. The farm is a one man’s interest in gardening since 1983. That was not all that day, the first activity for the teams was to drive to Manapad, a picturesque town on the cost about 60 km away from Thoothukudi. 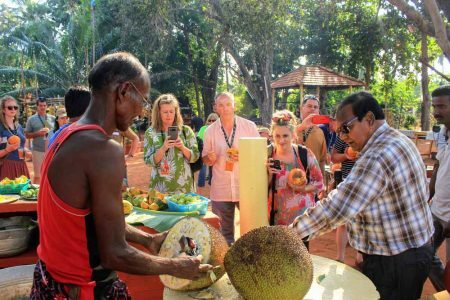 All went on fantastic, the farm surprised many people, a small walk around the garden, making pongal, media glare, dinner at farm and convoy to the base hotel. All the activities followed one by one and there was no incident except a flat tyre for Team 13 at the start of the convoy. The Chennai Garage team needs to be appreciated for their precision this time as well. The drive to Kanyakumari was made interesting with the suggested route of Papanasam Dam and Manimuthar Falls. Even though the entry to the Manimuthar falls was closed due to heavy rain and heavy water flow in the falls, teams enjoyed the route. The mountain passes and the water way stood as major reason to photograph. Yes, we had couple of calls for support and the best was the call from the police station of Pannakudi as the activity of the day (find the police station and find out the name of the inspector-in-charge) failed to amuse the police man on duty. Meeting of the Indian Ocean with Arabian Sea and Bay of Bengal with a perfect sunset is the highlight of the day. By a blink of an eye all the events got bundled up and came to the final drive. The final drive was another uneventful day. All said and done, the surprise element is that 32 teams and 80 participants all are fine and found the destination in Trivandrum. Team 1 Savills Surveyors won the charity award for their contribution in raising money for Round Table India. Team 21 Tinky Winky was judged the Bonkers, because of Paul Furber, man with an offensive water gun and crazy man who brought all his friends to enjoy the crazy stuff in India. Finally the world championship was won by Team 24 The super Marios, for their perfect score on every aspect of the rally. 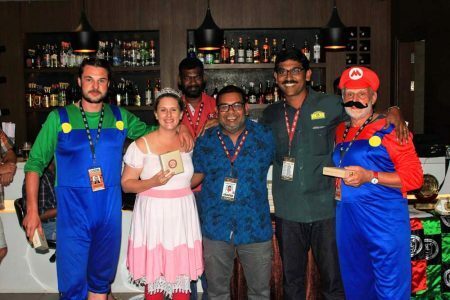 Thus, the great epic drive of the Rickshaw Challenge, Classic Run 2019 came to an end in the bar of the base hotel. Where the flag was ceremoniously dropped by Aravind and that marked the finish of the tour. The Good time continues, come join us in further rallies to enjoy the moment and definitely one of the most life changing activities you would ever remember. See you for an adventure and until then bye from me and the organization. Are you crazy enough to come along for the ride? Then join us on the next Rickshaw Challenge. Get a team together and let’s see you at the starting line! If you want to join us in spirit, like us on Facebook or follow us on Twitter and Instagram to keep up with our latest antics.